This is my second trip to Cottonwood and not much has changed. 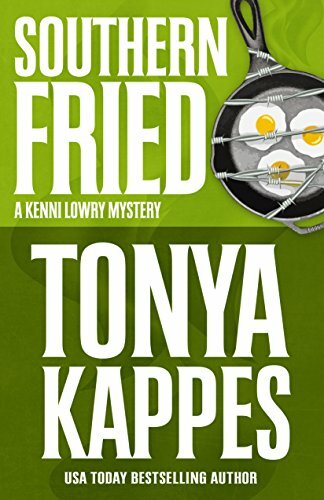 Sheriff Kenni Lowry is still trying to prove she can do her job even to her own mother. When another dead body is found some of the residents blame her for the surge in crime and a retired officer throws his hat into the ring to run against her in the next election. This doesn’t sit well with Poppa, her grandfather, the former sheriff, a ghost, that strives to help her protect the community. Time to use a little Southern wit and charm at a few local events to try to move her investigation along. A cook-off competition seems to connect her suspects but knowing this town it could be any little thing that caused one of the residents to turn on one of their own. I knew when I loaded this book onto my Kindle it was going to put a smile on my face and it did. The story opens with Kenni and Finn on a Ferris wheel and I am thinking their relationship is about to take a big step but then they receive a call for assistance and the moment is totally lost. When the sheriff arrives at Petal Pusher’s Landscaping with her ghostly sidekick they find Owen Godbey dead in the greenhouse, face down in the owner’s prize tomatoes. Myrna Savage, the owner seems more concerned about the smashed fruit than she is a dead employee. Soon the investigation takes off and a certain amount of hilarity ensues. These characters are a pure treasure. Kenni’s relationship with her grandfather warms my heart and the man had me laughing out loud more than once. Finn and Kenni work well together and would probably play well together too as soon as they sort out a couple of things. The residents of Cottonwood are an eclectic group, full of p&v as my grandmother used to say. We saw that you don’t want to mess with Kenni’s mama. It is okay if she tries to talk Kenni out of being Sheriff, but no one else had better say Kenni isn’t fit for the job. Talk about a turn around. The murder mystery seems to revolve around a cookbook. Everyone is trying to find it because it contains a very important secret, something about okra. There are several twists and turns and I started to put things together a little quicker than Kenni, but not by much. I found the plot to be very clever and entertaining. If you like your cozies with a bit of Southern sass and charm then this is the perfect story for you. It is sure to tickle your funny bone too. Find all of Tonya’s books on Amazon here. Book will be sent direct from Amazon. Hope I win! Thanks for the opportunity! Have this author on my TBR list and after your review I’m moving her to the head of the list. I could definitely use some humor in my life right now.